Mold in Austin can be especially bad during rainy, humid months, when flowers and trees bloom and are wet, giving natural places for mold to grow. Mold lurks everywhere in the world, working hard to break down all types of organic compounds where moisture is present. We work equally as hard to prevent mold growth in our homes and businesses to avoid structural damage like rotting wood and health issues like asthma and allergies. Follow these tips to help mold prevention. Does mold color matter? Mold comes in a rainbow variety of colors: pink, yellow, green, black, and hues in between. Mold varies in shade, texture, spore size, and surface preference (ideal setting to grow and spread). Identifying these factors helps us correctly name the mold and prevent it from spreading. 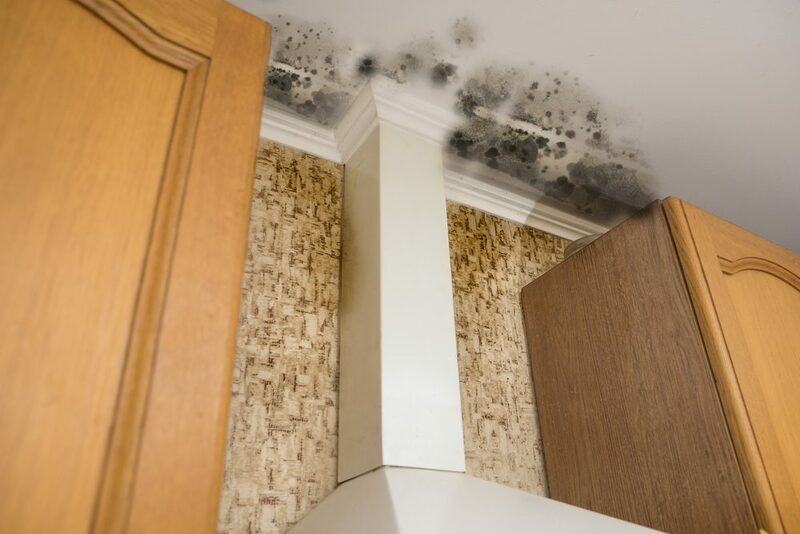 Black mold, known to professionals as Stachbotrys chartarum, is a greenish-black fungus that likes to grow on drywall, cardboard, paper, dust, and lint. The Centers for Disease Control and Prevention (CDC) says that black mold grows “…when there is moisture from water damage, excessive humidity, water leaks, condensation, water infiltration, or flooding. Constant moisture is required for its growth.” Improperly sealing shower tile, allowing water to flow behind the tile and on the drywall while the shower is running, is an example of how black mold can form. Even though toxic black mold is the least common mold, it is not rare. Is black mold toxic? Unlike other mold spores, the spores associated with toxic black mold are mycotoxins. Mycotoxins are poisonous chemicals that are present on the spores and small fragments of mold and fungus. They can cause allergies, asthma, and serious symptoms, even death, in humans and other animals. The effects of black mold are still being debated in the professional world. The CDC is not convinced that black mold is as toxic as the media has reported. There were once rumors that black mold can cause health issues like memory loss and lung hemorrhages. To date, there has not been enough evidence to link these issues to black mold. However, people with immune suppression or an existing lung disease may be more susceptible to fungal infections caused by black mold spores, so it is important to take extreme precaution when black mold is present. No matter what color the mold is, if you find mold, you should remove it. Black mold removal is something that requires a lot of protective gear and patience. If you are not sure that is something you want to tackle, call a professional to perform a black mold test, safely remove any mold and mitigate black mold health effects. Using professionals also limits your black mold exposure. Locate the source of the moisture. If there’s water damage because of a leak or humidity from improperly vented appliances, these issues will have to be fixed so the mold doesn’t reappear later on. Seal all doorways and openings leading to the mold using heavy plastic sealed with duct tape to prevent mold spores from traveling. Use an exhaust fan to remove mold spores from the area to blow them outside. Wear a mask or respirator that is rated for black mold protection. Clothe your entire body, including hands, arms, and legs, to prevent contact with the mold spores. Scrub any visible mold with soap, water, and a sponge. Spray any dry mold with water before you scrub to reduce the amount of airborne spores. Use black mold removal products to disinfect the affected and surrounding areas. Be careful if you use bleach that it will not stain the areas you are applying it to. Place everything you used in a heavy duty garbage bag, knot it tightly. Exiting outside in the fastest route to dispose of the bag helps reduce the chance of mold spores becoming airborne. Blackhill Restoration is a leader of mold removal in Austin. Contact us today to have one of our professional IICRC Mold Certified Estimators come out and perform a mold inspection. Our assessment will determine why you are experiencing excessive mold growth and provide you with a mold estimate on how our team will perform mold removal and mold remediation services. Blackhill specializes in both commercial restoration services and residential home restoration services and repairs in the Austin, Temple, Belton, Killeen, Bryan, College Station, Waco, San Antonio, and surrounding Texas areas. Blackhill is a first response, emergency services restoration team that is here to help when the need arises. 0 Comments on "How to Get Rid of Black Mold"